Does your head spin at times when discussing Websites and Internet Marketing? Does everything just sound like alphabet soup? 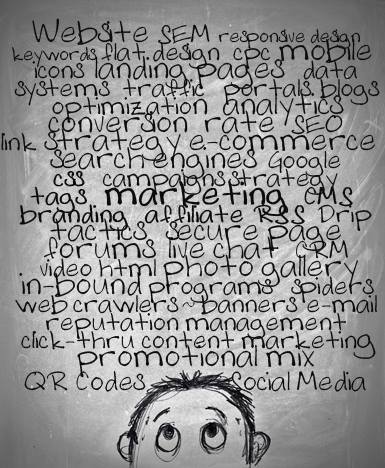 HTML, RSS, CRM, CMS, PPC, CRO, SEO are all acronyms that can drive you crazy. Each time you turn around do you hear a new term? Responsive design, conversion rate optimization, geo-targeting, mobile marketing, video marketing, social media: 5 years ago how much did you know about these things? Do you have time to keep up with it all? Well, that is one of the reasons ePlus Marketing was founded in June of 2000. Companies were putting their entire Internet marketing into the complete control of a programmer or technical designer. Does that make sense? Isn't it somewhat like going to your printing and asking them to write your brochure copy and select print ad placement? Now, business owners are inundated with companies who use global outsourcing for marketing or kids right out of college. Do either of these groups really understand critical business activities? While programmers and designers are needed to develop a Website, they should not be the leader. Sound business and marketing principles, strategy and methodology should take center stage of your Internet marketing. You need a partner who puts skilled business and marketing professionals in charge of your projects. If you want seasoned business and marketing professionals with a proven track record to not only guide you through the Internet but help you accomplish your goals and objectives, you came to the right place. Read or listen to our testimonials, read our case studies. You'll see some of the types of success we've had increasing the return on investment for our clients. Not only will you be guided through the Internet jungle, you will reach or surpass your marketing and business objectives. Then contact us to discuss your project or let us start with a free marketing assessment. You'll soon find out why our clients love us.